I love free stuff. I love it even more when it works. And while I am a natural skeptic of the usefulness of free software (thus contradicting a timeless programmer's joke), the ability to run KisMAC-ng with an AirPort Extreme interface in Monitor mode is quite nice. 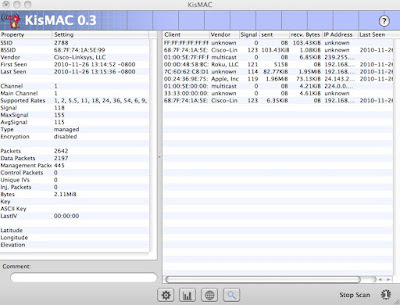 Not as nice as it could be if a few little tweaks were made to the software, but for a free product it remains the best WiFi sniffer for Mac OS X. 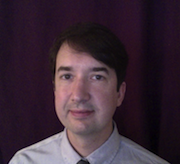 The Internet wireless community was set aflutter last week when Eric Butler, a freelance developer from Seattle, introduced Firesheep, a Firefox extension that is advertised as a way to perform sidejacking attacks over unencrypted wireless networks. The software is super slick and all, but what interests me is the way it handles frame capture. For those who may have missed it, Firesheep is a Firefox extension that allows users to view web sessions that are active on the channel. It works via a wired or wireless channel, but the prospect for wireless viewing received much more press because, A) nobody uses hubs anymore, and B) wireless vulnerabilities always get much more press.